20th Century Fox Home Entertainment have renewed their deal with MGM to market and distribute the lion's film catalog until 2020. Along with the usual MGM back catalog like Rocky and the Pink Panther, the big fish is the James Bond series. "Our partnership with MGM has been a tremendous success over the past 17 years," said Mike Dunn, President Worldwide, Twentieth Century Fox Home Entertainment. "It is a privilege to continue to steward their prestigious library of commercially and critically acclaimed films." MGM chairman and CEO Gary Barber said: "We are thrilled to renew our longstanding partnership with 20th Century Fox. The Fox Home Entertainment team have delivered strong results for MGM and we look forward to more success together in the future." Fox have been selling 007 on DVD and Blu-Ray worldwide since 1999, so it was of no real surprise that MGM would renew the same deal and keep the royalties flowing. Fox will also pick up Digital HD and transactional VOD sales for MGM. However, that does take away a major revenue source from whichever studio partners up with MGM to make new James Bond films. Consider the recent deal Sony struck to provide the majority of the budget for the Daniel Craig films when MGM was financially unable to fund their own film series. Sony got a small piece of the box-office haul (in a deal many industry watchers considered to be bad for Sony taking only $57m profit from the $1.1b gross) and 20th Century Fox got to distribute the home entertainment releases with no huge outlay or risk. Although revenues from physical home entertainment releases are slowing, as more consumers move to streaming and digital downloads, it's still a lucrative part of the movie business with most of the profits on wide releases coming after the box-office has closed. 'Casino Royale' sold 4.7m copies in the US in 2007, 'Quantum of Solace' sold 2.8m in 2009, 'Skyfall' shifted 5.2m in 2013 and 'Spectre' has already shipped 1.9m units this year (showing the overall decline in physical media sales). 007 on disc accounted for $250m in first year US retail sales for just the four Daniel Craig films, not counting the back catalog, box sets and re-issues. 'Casino Royale' has made $210m over the past 10 years in the US on disc and was the 9th best-selling DVD of all time in the UK. 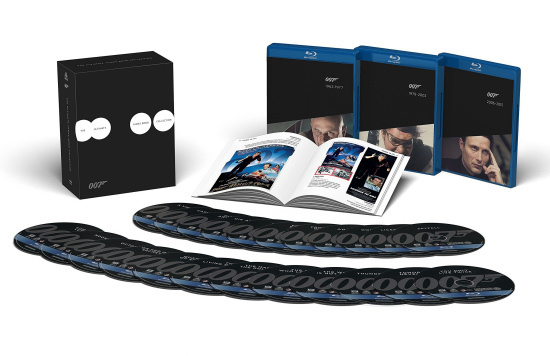 2015 James Bond steelbook reveal video. According to Sony Pictures, formal discussions on a new deal with MGM to finance and distribute new James Bond films have not started yet. "I'm not going to comment on that," said Tim Rothman of Sony talking to the Hollywood Reporter last week. "Other than to say that we remain very interested in continuing that excellent and important relationship. And I think we have certain advantages as the incumbent. No discussions have started yet."